There's an old adage that states, "To defeat your enemies, you must know your enemies." This way of thinking could not be truer in the case of playing a game. That's why manuals and tutorials give players a little bit of background information on the enemies they will encounter. But I like to take it a step further and really take the time to study creatures in-game. Monsters are so much more than a little game manual blurb and photograph make them out to be. They are living creatures with their own ways of life, body systems, favorite foods, and strengths/weaknesses. Today, I will take you through the ins and outs of one of the most prolific monsters, the slime. Most well known in its Dragon Quest variation, these creatures span across several different universes. But even after encountering them in so many places, do you know what makes them tick? The bone isn't a part of the slime's inner body, it's just its lunch. As you can see, the anatomy of a slime creature is extremely simple. 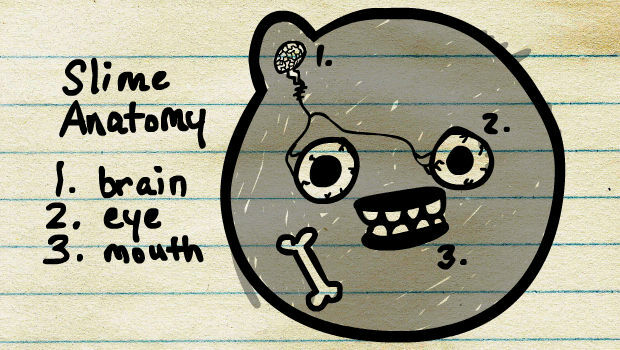 Only a few basic organs float around in the goop that makes up their bodies. The brain can usually be found somewhere near the top of the body. It is very tiny and dictates sight and movement. There are some exceptional cases that are also capable of speech and some free thought. But in most cases, slimes are a little on the stupid/carefree side. The eyes are fairly self explanatory. They help slimes to see where they are going, and whether or not anyone or anything is in their path of travel. Most subspecies have at least one eye, but there are a scant few that have none. Eyeless slimes most likely use sound waves to get around. Their bodies jiggle as sound passes through them and react accordingly. Although many of them have mouths, it is very seldom used for eating. Most slimes derive nourishment from absorbing the items they come across. An object can stay in the body for several weeks before being completely digested. This suggests that the matter a slime's body is made up of is weakly acidic. Because of their tiny brains, they tend to pick up all sorts of things in addition to food. This is why adventurers often find things like gold coins and old equipment after defeating one. Not to be confused with mudmen, who have similar shapes but are made of earth, not jelly. These monsters come in many different shapes and sizes, the most common of which is the teardrop shape. Then there is the oval and the blob, the latter of which is the most versatile. 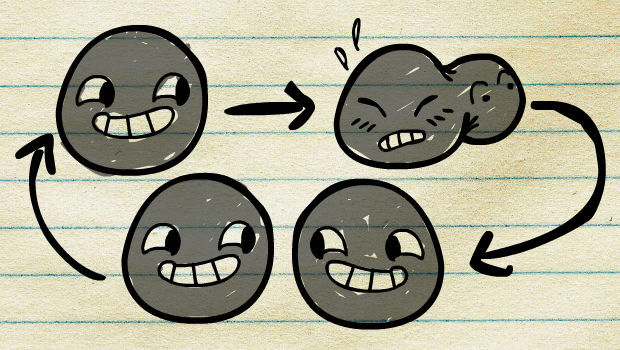 Blobs may sometimes have extensions that act as limbs, though all slimes have the ability to stretch their bodies. When traveling, they act a lot like water, expanding and contracting to fit the spaces they need to get through. Slimes are, more often than not, one of the first creatures one will encounter in a videogame. As such, they are easily defeated. It's only when you face more than one that they can get to be a problem. For example, in the Dragon Quest universe, several slimes can meld together into a powerful King Slime. In other areas, they attack in groups or in tandem with other types of monsters. They find great power in numbers. Do slimes even feel pain, or does it just travel really slowly to the brain? That is one thing even I could never figure out. So why do we kill them if they are too stupid to mean any real ill will? They're not just holders of experience and loot. Some kill them because they reproduce extremely quickly. They are capable of asexual reproduction once every few minutes, and it is often used as a means of self defense (as can be seen in Secret of Mana). Otherwise, they just kind of go and do it as they please. 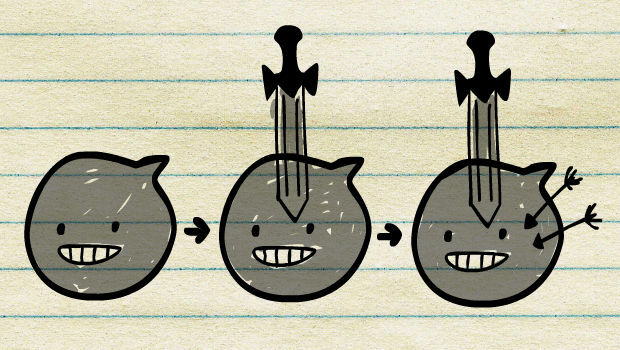 A single slime can create hundreds of clones a day, and those clones can create further clones, and so on, and so forth. There are mandates in most worlds to kill slimes on sight, as to help keep their populations down. It is also ill advised to keep one as a pet, regardless of how insanely cute they may be. Without the right training, a pet slime can grow to be a big problem very quickly. There is no known way to "neuter" them; they just keep reproducing willy-nilly until they are killed. Slime overgrowth is a very serious matter and can damage the quality of life for the slimes themselves and the other living creatures in their worlds. One other reason that we kill is for food. Some cultures see slimes as a never ending source of jelly. Have you ever wondered if they taste like whatever flavor their color suggests? They do. Some really nasty flavors are out there, so it takes a trained eye to be able to hunt slimes for food. Less palatable ones are sometimes used by smaller, less developed cultures as salves, but there is no scientific proof that slime jelly has any healing properties whatsoever. It is most likely just a placebo. The slime reproductive cycle. Only slightly less gross than reproductive cycles normally are. But not all slimes are bad! I have studied a few strange cases where these gelatinous creatures have worked on the side of good. Take, for instance, Blobby (A Boy and His Blob) or Gooey (from the Kirby series). They have even become heroes from time to time, in the case of Rocket (DQ Heroes: Rocket Slime) and Jerry (Smart Ball/Jerry Boy). Slimes like these prove that they can be noble, hardworking creatures if they absolutely have to. In the meanwhile, we will keep coming across their brethren on the battlefield and slicing open their gooey centers for gold and EXP. But from this point forward, you can do so knowing everything about the little creature you are slaying. 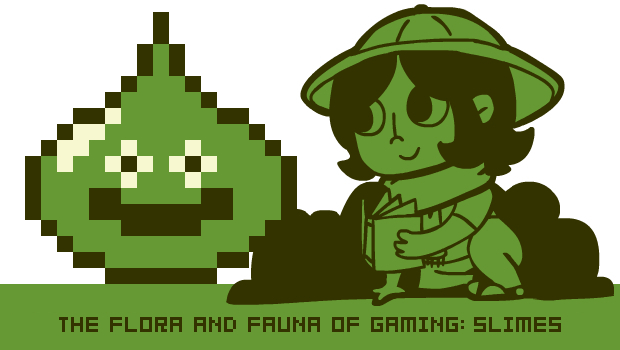 Know that you must kill them to further your adventuring career and to help the environment! It is cruel, but it is the way of virtual nature. Other notable slimes include Puyos (Puyo Puyo series), Puddings/Flans (Final Fantasy series), and Salvo the Slime (Yoshi's Island).